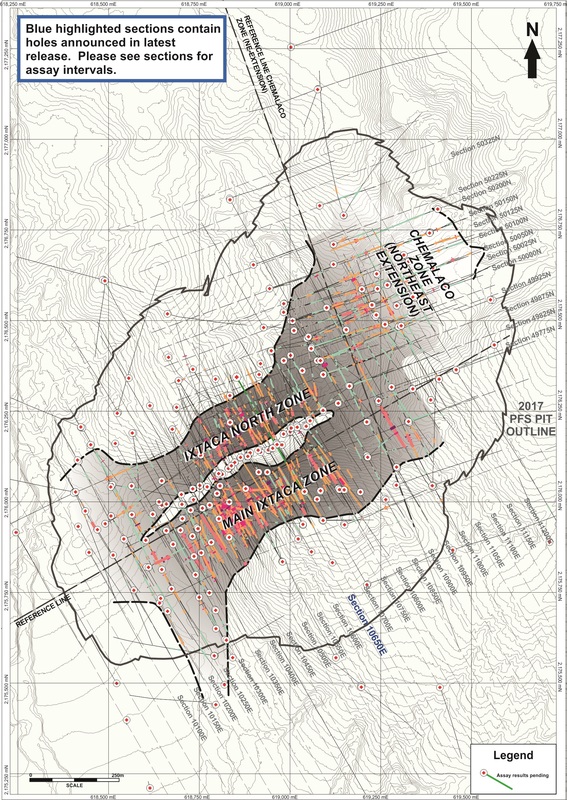 The mineralisation reported today confirms the importance of the emerging Ixtaca North Zone, and demonstrates the potential to convert what is currently classified as waste to ore-grade material through continued drilling in the area of the Ixtaca North zone. 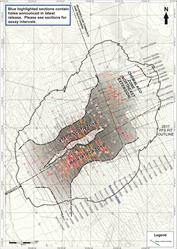 The Ixtaca deposit was discovered in 2010 beneath a large area of largely barren clay alteration which has been confirmed subsequently to represent the upper portions of a gold and silver bearing epithermal vein system. 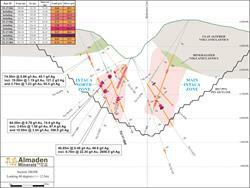 Since the discovery Almaden has focussed its efforts on the development of the Main Ixtaca Zone, however, today's results clearly show the potential for additional mineralisation, not only proximal to the deposit, but more broadly project wide beneath the high level clay alteration. J.D. Poliquin, chairman of Almaden stated, "While we have established Ixtaca as a prominent new discovery of gold and silver reserves, we are clearly only at the beginning of the discovery cycle at this project. 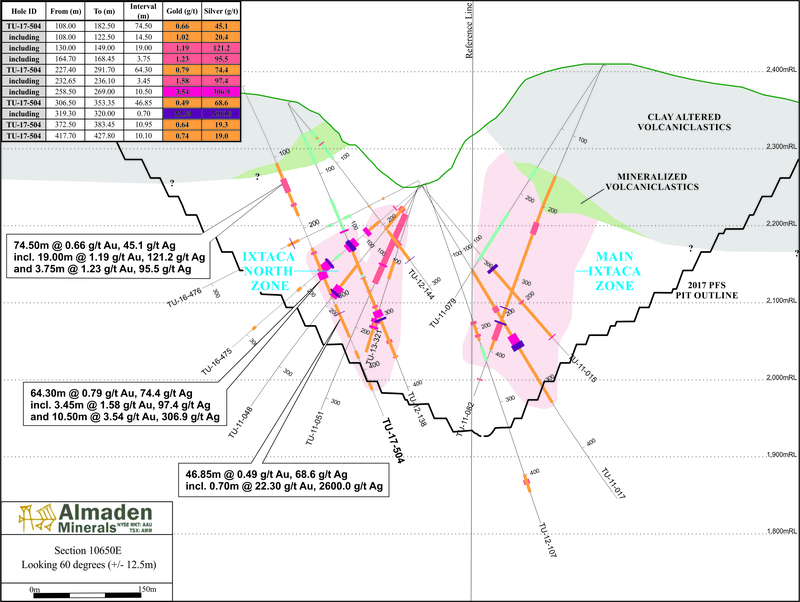 Ongoing drilling in areas within and proximal to the PFS pit will provide very useful input into the continuing work to deliver a feasibility study early next year, and will begin the process of testing new targets on the Tuligtic claim." Neither the Toronto Stock Exchange (TSX) nor the NYSE MKT have reviewed or accepted responsibility for the adequacy or accuracy of the contents of this news release which has been prepared by management. Except for the statements of historical fact contained herein, certain information presented constitutes "forward-looking statements" within the meaning of the United States Private Securities Litigation Reform Act of 1995 and Canadian securities laws. Such forward-looking statements, including but not limited to, those with respect to potential expansion of mineralisation, potential size of mineralized zone, and size and timing of exploration and development programs, estimated project capital and other project costs and the timing of submission and receipt and availability of regulatory approvals involve known and unknown risks, uncertainties and other factors which may cause the actual results, performance or achievement of Almaden to be materially different from any future results, performance or achievements expressed or implied by such forward-looking statements. Such factors include, among others, risks related to international operations and joint ventures, the actual results of current exploration activities, conclusions of economic evaluations, uncertainty in the estimation of mineral resources, changes in project parameters as plans continue to be refined, environmental risks and hazards, increased infrastructure and/or operating costs, labour and employment matters, and government regulation and permitting requirements as well as those factors discussed in the section entitled "Risk Factors" in Almaden's Annual Information form and Almaden's latest Form 20-F on file with the United States Securities and Exchange Commission in Washington, D.C. Although Almaden has attempted to identify important factors that could cause actual results to differ materially, there may be other factors that cause results not to be as anticipated, estimated or intended. There can be no assurance that such statements will prove to be accurate as actual results and future events could differ materially from those anticipated in such statements. Almaden disclaims any intention or obligation to update or revise any forward-looking statements, whether as a result of new information, future events or otherwise, other than as required pursuant to applicable securities laws. Accordingly, readers should not place undue reliance on forward-looking statements.